The Nissan Qashqai has won the Auto Express Car of the Past 30 years Award. Launching in 2008, the Qashqai created the brand new segment of Crossover, offering the practicalities of an SUV but with the running costs of a hatchback. Nissan’s SUV crossover has undergone significant evolution in the course of it’s decade long life and still remains the most successful European model in Nissan’s history. Generation 2 (2013 - Present): This latest facelift offers significant enhancements, stylish exterior and interior, improved driving performance and additional new Nissan Intelligent Mobility technologies. 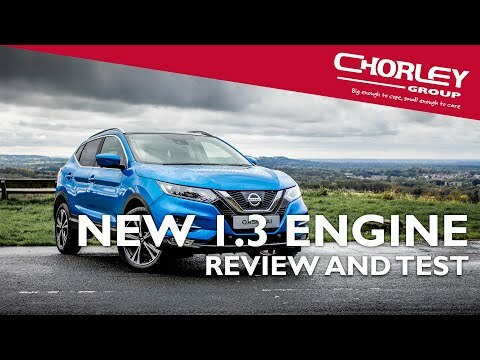 As of 2018 the Qashqai has undergone further enhancements, with a facelift and the launch of the new low emission 1.3 DIG-T petrol engine. The Nissan Qashqai is available in various different 'grades' starting with the basic Visia then Acenta, NConnecta and finally the top Tekna grade. It's never been easier to finance a Nissan with Chorley Group. All vehicles can be purchased outright at our current Cash Price offer, however an overwhelmimg majority opt to finance new cars with a finance agreement, paying monthly for the vehicle over an agreed period. These finance agreements come in a variety of flavours to suit your personal requirements. Now available with a new 1.3-litre DIG-T petrol engine, miles ahead of rivals in emissions, VED rates and BIK. The 1.3 DIG-T is available in two speeds, 140 PS and 160 PS. The 1.3 DIG-T is also available in Automatic Transmission at 140 PS. The 1.4 dCi Diesel engine is available on Manual transmission. Connect your worlds with Android Auto® & Apple CarPlay®​ and your Qashqai becomes your smartphone’s best friend​. The Qashqai will also keep you in the loop with Bluetooth hands-free calling, audio streaming, digital radio (DAB+) and an iPod/USB input.​ Available from Acenta Premium. Parking made easier than ever, thanks to multiple cameras delivering you a panoramic Around View Monitor.Moving Object Detection and Rear Cross Traffic Alert help mitigate the risk of low-speed impacts when reversing out of a parking space, is now available for the first time. If the driver attempts to reverse when an approaching vehicle is detected, the system gives visual and audible warnings. Available from N-Connecta. Create an expansive 360° listening experience throughout the cabin. The Qashqai is available with an all-new eight-speaker system. Supplied by BOSE®, Nissan’s premium audio partner, it features two 25mm tweeters at the base of the windscreen, a 165mm woofer in each front door and a 130mm mid-range speaker in each rear door. Available from Tekna grade. Sleeker looks, smarter design. Featuring a contemporary new look – a style Nissan calls ‘Premium Dynamism’ – the upgrades are visible from every angle. With an integrated new front bumper fitted as standard. It features much greater use of the car’s body colour, with the visible black plastic benefiting from a more premium gloss finish. Vents on each side aid engine cooling. Premium alloy wheel designs in 17, 18 and 19-inch sizes, have all been aerodynamically optimised to reduce drag. More action, less distraction with Nissan Advanced Drive-Assist Display. The New QASHQAI’s Advanced Drive-Assist Display puts all your info right in front of you - just toggle between the screens using the steering wheel controls. Easy. Includes Caller ID, Turn-By-Turn Navigation, Steering Mode, Tyre Pressure Monitor, Parking Sensors Display and much more. Heated front seats offer premium comfort when the temperature drops. They’re the best in the house: with their new monoform design and finished in high quality Nappa leather with soft 3D quilting, the seats in the New Nissan QASHQAI envelope you in lasting, luxurious comfort Available on Tekna+.